Climate Model Diagnostic Analyzer (CMDA) provides datasets and analysis tools for the summer school student group research projects in JPL Center for Climate Sciences Summer School. 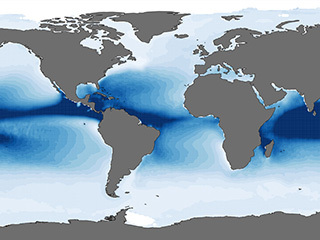 These images show key NASA spaceborne observations of the ocean and atmosphere as they are changing with the current El Niño system. A new multi-sensor multi-parameter Earth System Data Record of state of the art observations of the cloudy boundary layer was created as part of the MEaSUREs Program. Jet Propulsion Laboratory is leading a project for NASA that is bringing satellite observations into a format that will make them easier to compare with climate models.